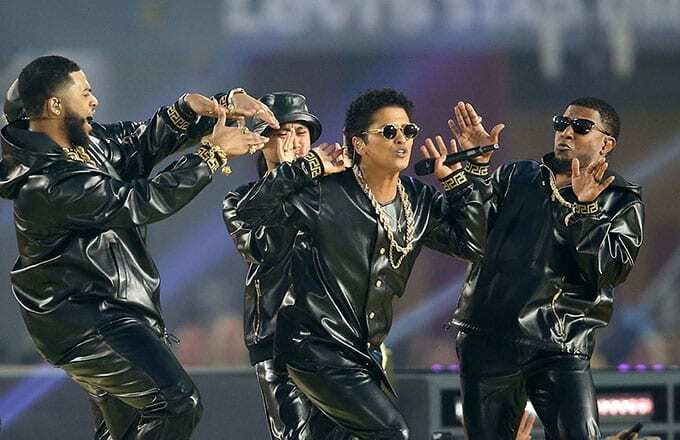 During tonight&apos;s Super Bowl 50 halftime show, Bruno Mars hit the stage alongside Coldplay and Beyonce, performing his huge hit "Uptown Funk." While Beyonce stole the show with her performance of "Formation," complete with an homage to Michael Jackson&apos;s Super Bowl XXVII performance outfit, Mars held his own style-wise. He performed in a custom Versace outfit, made up of a liquid effect leather baseball shirt and matching pants. Mars finished of his custom &apos;fit with some simple, yet always fresh looking Nike Cortez&apos;s, as well as some heavy gold rope chains. Take a look at some more photos from his performance below.